The past week seemed to fly by. I was all aches for Monday and Tuesday still from the mountain trip, but my classes were very subdued. All the students have been studying more and more recently, focused on upcoming tests that Friday, so most other activities and classes were cut short. On Thursday and Friday me and my co-ALT had hardly anything to do except knock out revisions of the tests one by one. Of course it’s still mind numbing work, but in the swing of things it’s manageable and gives some leeway for me to spend time studying Japanese or be preparing for random lesson plans. Come Friday, though, I was already looking forward to the end of the weekend. In the beginning of October my school started implementing morning English lessons (improperly called “English Club”). 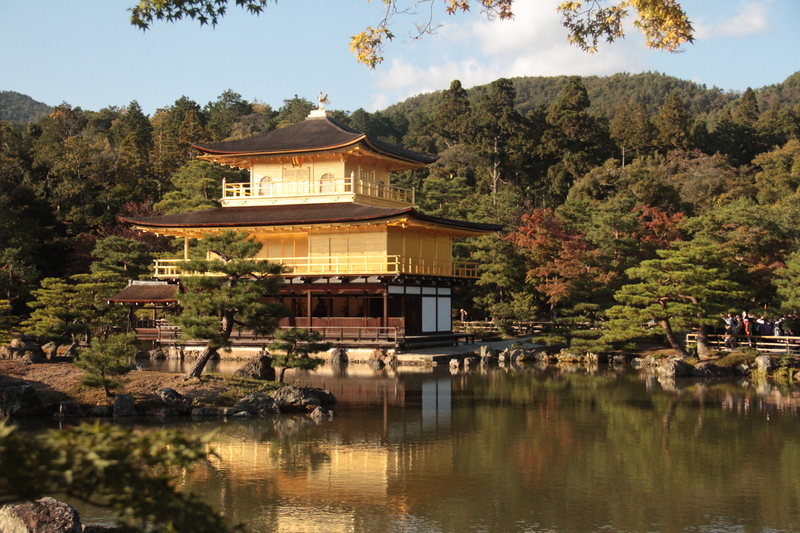 In small groups of four or five I would ask the students, “where do you want to go in Japan?” I got some varying answers, but typically it came down to five places: Okinawa, Hokkaido, Tokyo, Osaka, and Kyoto. These places were actually the most sought after that I would have uncanny moments during the conversation where my responses and their answers became verbatim to discussions I’d had groups before. Later I joked about this fact with one of the English teachers and mentioned that I had only been to Tokyo out of that group. 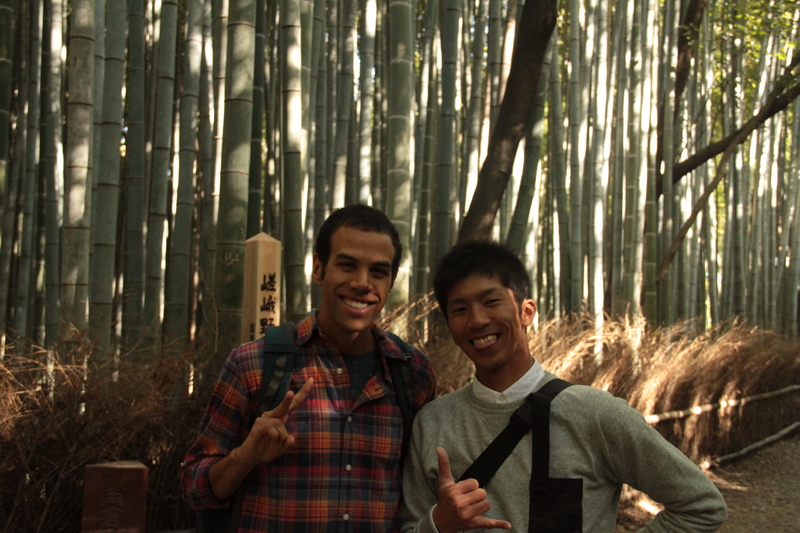 He suggested that we should go to Kyoto sometime, maybe a weekend at the end of the month and I politely agreed. So come Monday I was a bit surprised when he (sitting in the desk next to mine) asked casually if I was excited for this weekend. I flicked up the calendar on my computer to see that it was indeed the end of October and he was indeed being true to his word. Another Japanese cultural myth busted. Yet, as the week went by, I got my salary and had enough to go, the feeling still remained like: are we really doing this? After all, this is Kyoto we’re talking about, probably the second most well-known city in Japan my foreigner standards, and arguably the city with the longest history. But Sunday morning came and I was ready with a rain jacket and camera packed in my bag. The round trip the train cost about $60, and again it only shames me to think of all the weekends I wasted in Minnesota, not deciding to cheaply travel elsewhere. Hopefully–at least the way things are going–one thing I’ll learn from living here is how to seize the location or get out and explore the world a little better. I’ve made the argument that American cities are so far apart from each other (L.A., New York, Chicago, D.C.) but that’s also pretty contrary to my socialist beliefs of supporting the local communities in between. Anyway, the train ride takes a little under two hours on a Thunderbird train so I had plenty of time to think. We both were pretty tired so after a couple of ear popping tunnels we fell into napping. Off the train, though, was completely awakening. Kyoto’s main station is huge by any standards I’ve meet. Sure, Tokyo Station is vast, but it’s still all underground, so it feels more like a labyrinth. Here, though, seems more like an airport. As we waited on the platform for our train, the departing passengers flew out like a swarm of locust, a mash of people coming and going on the narrow track. It’s always a strange feeling now to be instantly surrounded by so many people. We stopped for a quick bite at a Lawson’s conbini. I got a nikuman, and a sports drink, although I could’ve eaten more. Had we not only had the day to spend there I probably would’ve forced us to get a proper lunch, but being frugal I was fine to be on our way. The sun was bright with clear skies and I was thankful being that it was a torrent of rain the night before (rain I got stuck in walking to and from the grocery store). The first place seemed to come out of nowhere. 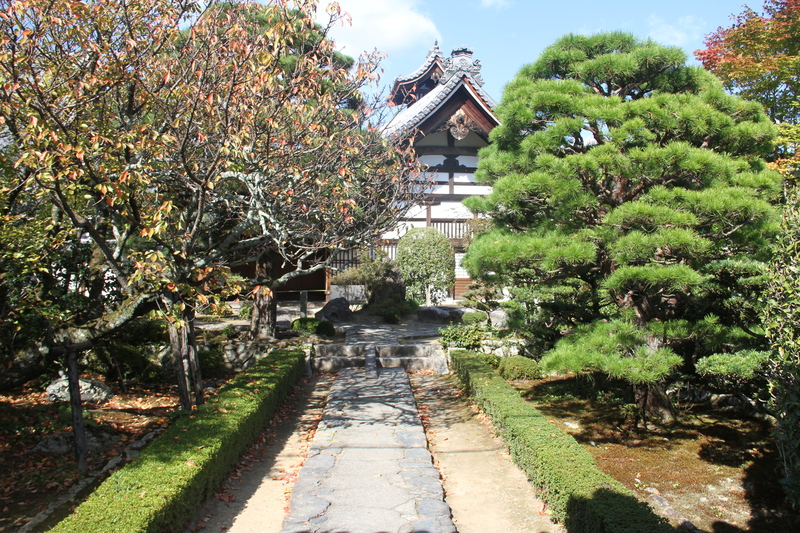 I still actually don’t know what it’s famous for, but it is a zen temple on the outside of town known as Tenryu-ji, or (based solely on learning certain kanji in my students’ names) I would guess it means heavenly dragon temple. The temple actually takes up an extreme amount of space. From our entrance we walked along a long pebbled road, passing by various smaller huts and temples. We stopped outside a small Shinto altar and I learned the proper Japanese way to pray for a wish for my ￥5 offering. 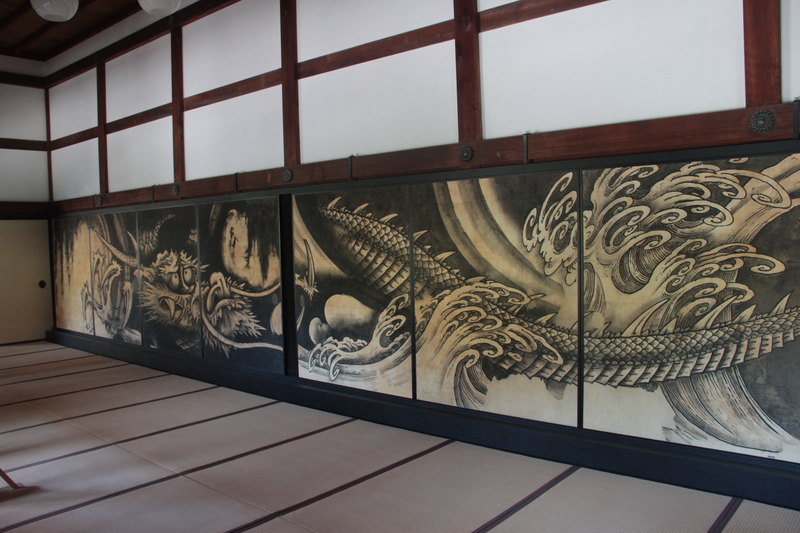 We first paid ￥500 to enter a building with the sole purpose of looking at the dragon painted on its ceiling. Now, the dragon is pretty large, as you might see on the website, and it’s even pretty inspiring, but not only as someone who studied Japanese art history, but with the western values of the Sistene chapel I can tell you it wasn’t worth ￥500. Especially because there were no photos allowed. 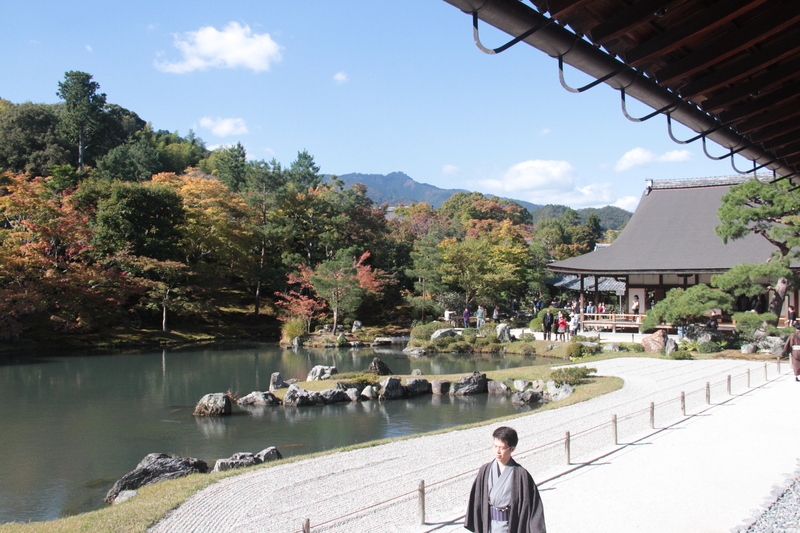 But, no matter because I was soon to find out that basically everyplace worth site-seeing in Kyoto cost ￥500. And as someone who earlier mentioned that I should have no problem supporting local communities (not that they need that much support) I put the cost of the trip behind me and decided to indulge. The temple would actually be a great place to lounge around in the day, and the gardens surrounding it are beautiful, but I think it’s most known for its bamboo forest. 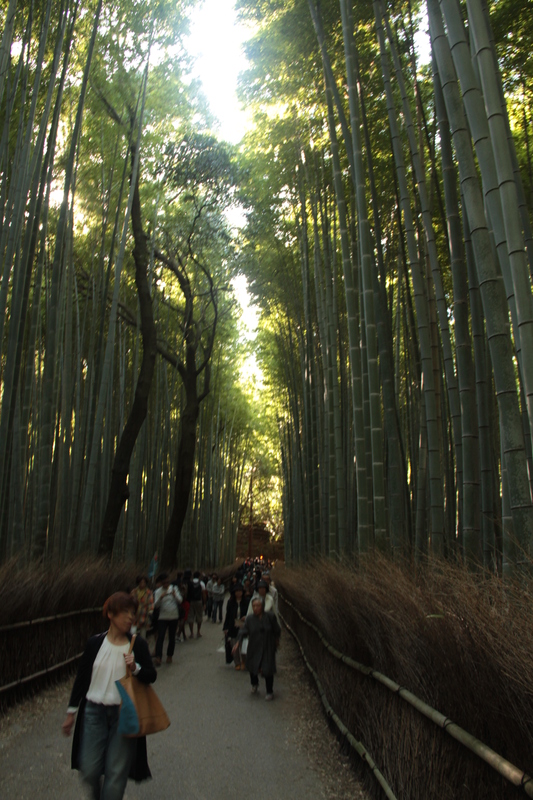 Now I thought I had known what a bamboo forest would be like. After all, throughout my life I’d seen my fair share of bamboo fight scenes. There’s something overwhelming about the sheer size that bamboo to get to. I was thinking that a thicket would be all pressed together and smothering, but instead this forest was incredibly tall, easily reaching 15 meters, with each shoot a good stride apart from each other. If I went again I would suggest probably going in the summer when the bamboo is more green, and definitely on a day with less people (if that were ever possible). Short on time I didn’t get to see if there was more to explore, but it didn’t look like it. We cruised back down the hill, I hadn’t realized how high up we were, and found an outlet along a river and popular tradition bridge. Eventually we walked to a different station with smaller old-style trains and got our ticket to head to Kinkaku-jiI, the golden temple. 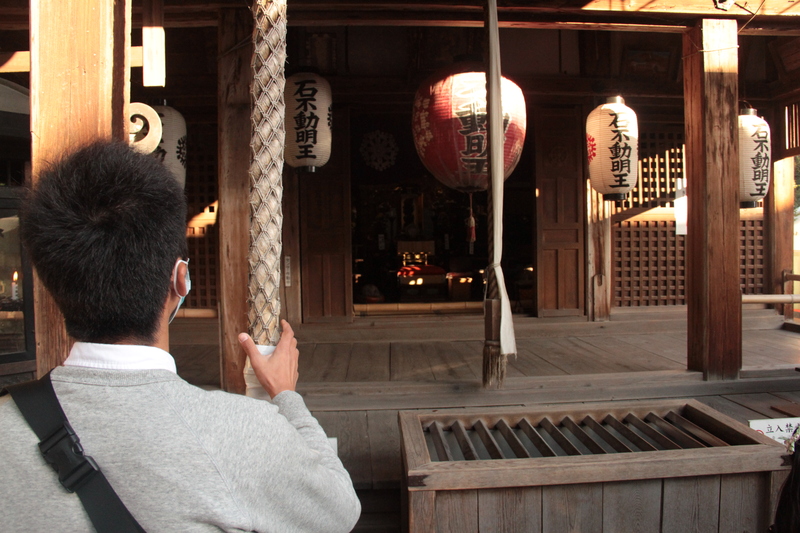 The approach to this temple is similar to Tenryu-ji, where it’s a long walkway to get to the actually entrance. 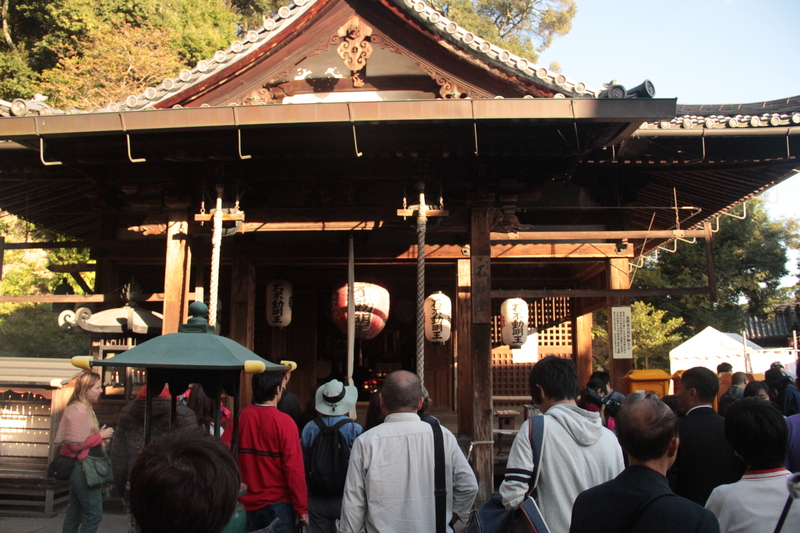 After paying another ￥500, we were mashed with a line of people shuffling along the narrow road to the view of this temple. It was particularly cool to see it in real life after briefly studying it in my Japanese art history class. Despite the tranquil facade the pictures often elude to–an insolated beauty in the mountains of Japan–the place is over commercialized, and it’s pretty hard to really enjoy among the mass of people. The fact that it’s actually leafed entirely in gold, though, is pretty stunning in real life as it radiates a special shine in the sunlight. The rest of the park is actually worthwhile, too. After rushing ahead of the school trip and Scandinavian tour groups, we decided to take a break to get some matcha (again for ￥500). 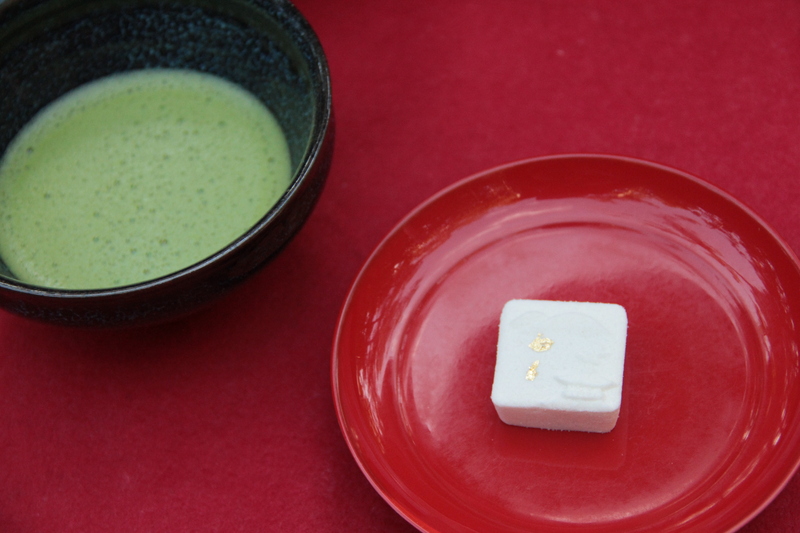 There’s a specific way to drink traditional green tea, which I learned, and it was pretty sweet that our little sugar/salt/anko dessert came with gold leaf on top. 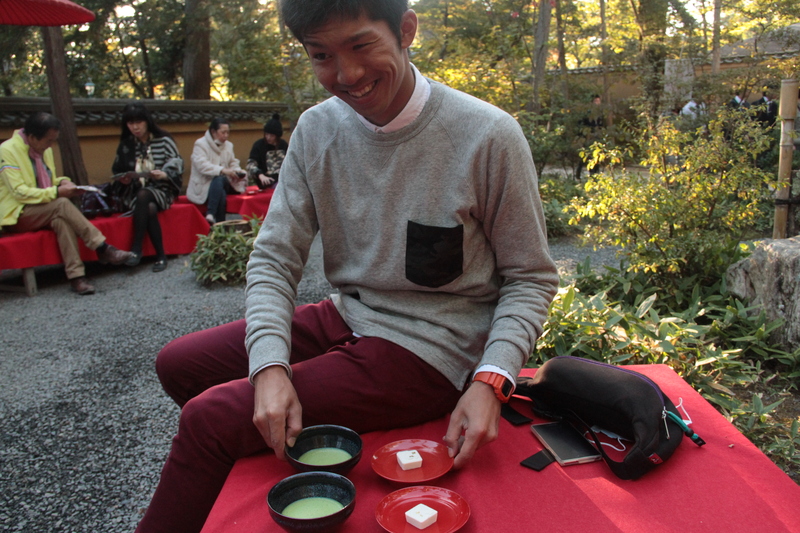 The warm matcha was well worth the pause. By now it was nearing four o’clock, and we still had one more stop out of the many options to go to. 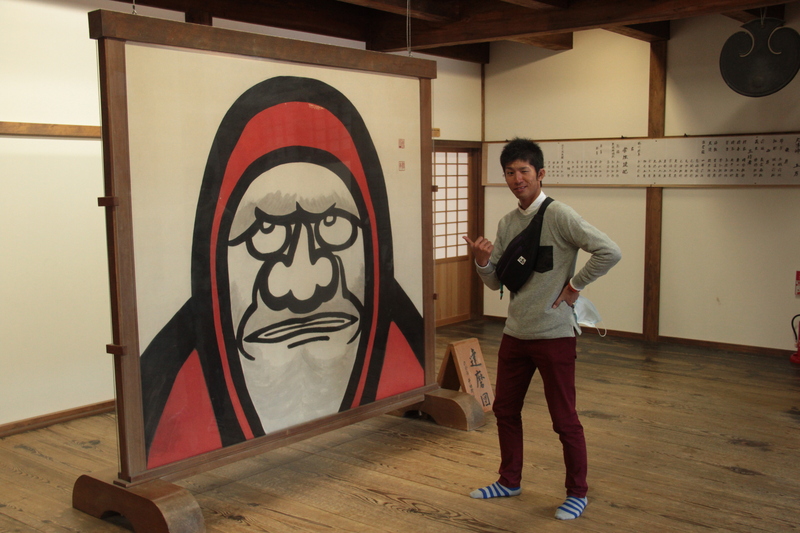 Apparently, it’s Isopp’s favorite place to visit in Kyoto, and seems like the general must see place. After flopping around to find the right bus, we finally got on the right one, cramped but seated, and made the forty minute ride across town. That’s probably what surprised me most. Kyoto has its own subway system, but nothing near to the extent of Tokyo. Still, the city is spread out, and it can’t take a while to get from one side to the other. We got off the bus and found our way along a famous road full of a majority of shops selling omiyage and souvenirs. Seriously, not a place to spend a quick day. It was super effective in getting me to see what Kyoto has to offer, but I’m already thinking about what do to when I go back. 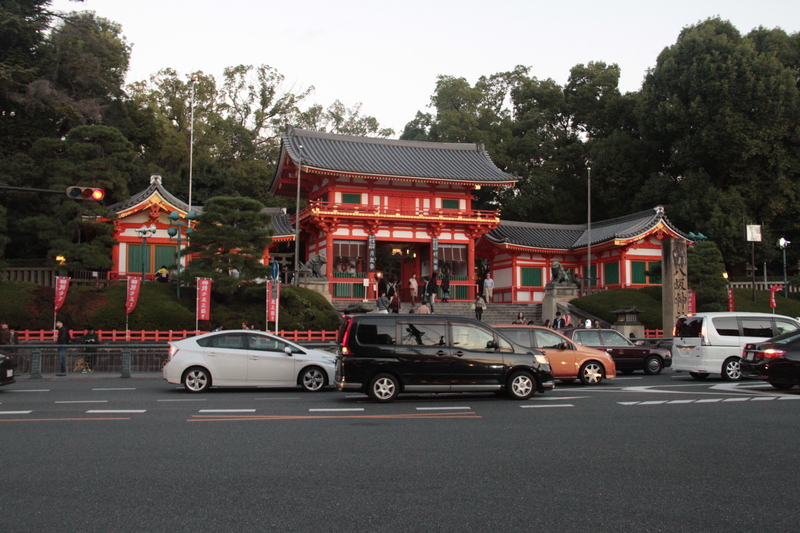 We took a brief pre-dinner stop at a random temple intersection. 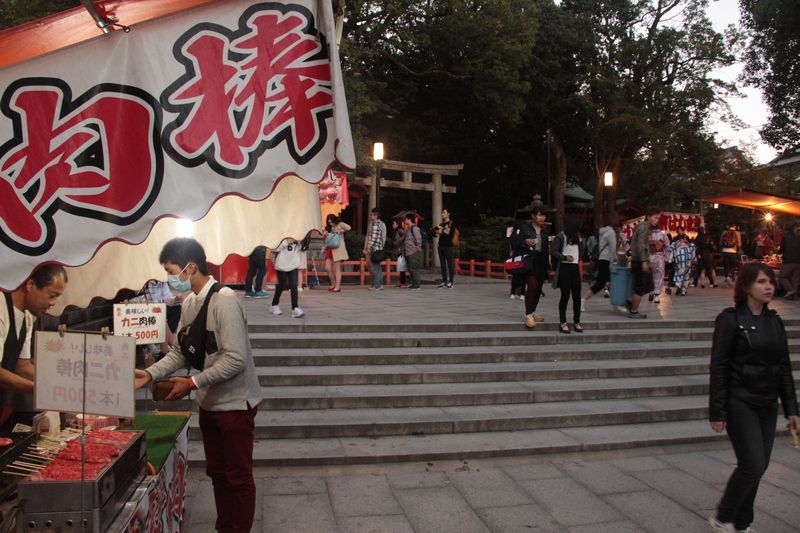 Once we got up the step and saw all the food stalls there was no stopping the hunger. Especially seeing the crab for (the trendy) ￥500. It’s been a long while since I’ve actually had crab (since a delightful dinner in Port Angeles, WA summer of 2013), and apart from the typical costs I don’t know why I don’t eat it more often. This was a great snack and lead us away from the busy street, almost magically, into 19th century Japan with the streets of Higashiyama. 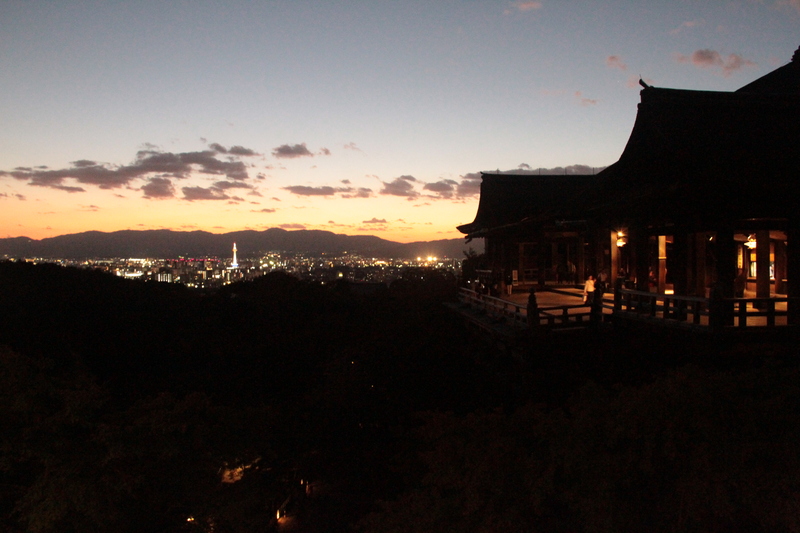 With the sun setting and the lanterns turned on, this place really felt like a different world. Around certain parts there weren’t many people, so even though we were getting low on time, I still could enjoy the feeling of being in the heart of Japan. 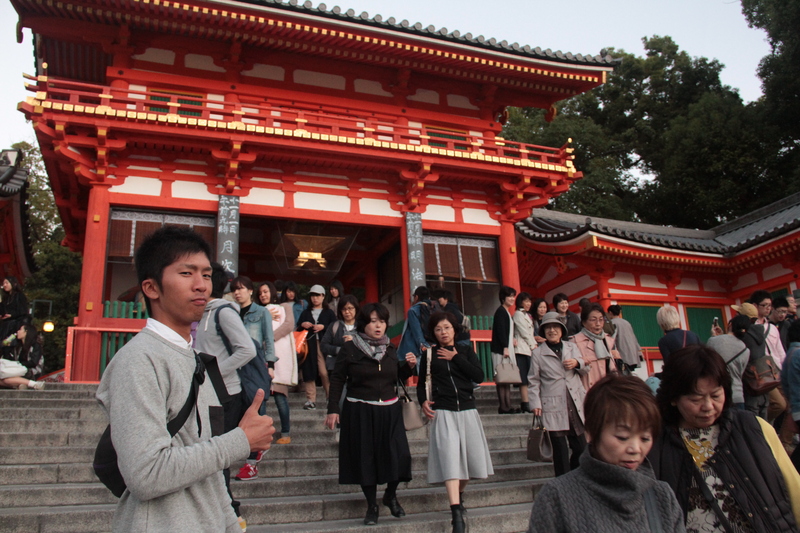 Of course, then we hit the final stretch up the hill to the famed Kyomisu temple and it’s iconic red pagoda. 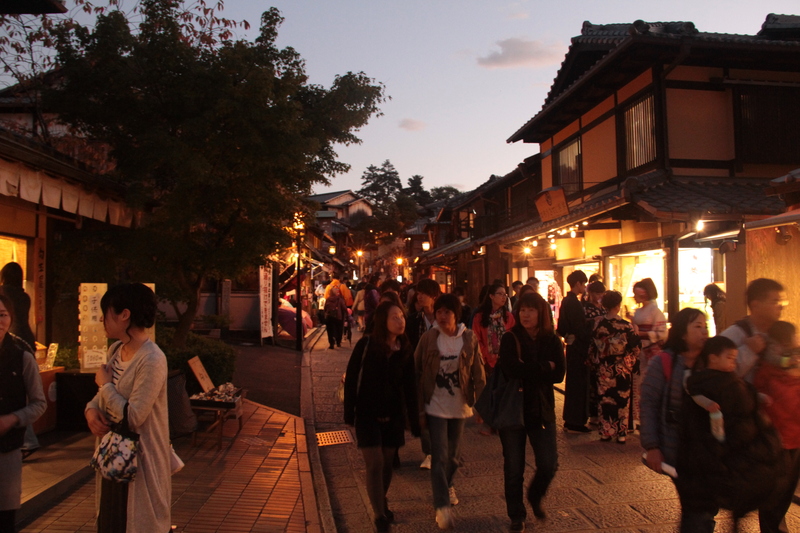 The streets were packed with stores solely selling omiyage and souvenirs, and people in kimonos, and foreigners afoot. It was bustling for a Sunday past 5 o’clock. We made it to the temple with half an hour left to peruse what easily could’ve taken half the day. Isopp through some change to the ticket counter and led me up steps and past altars. 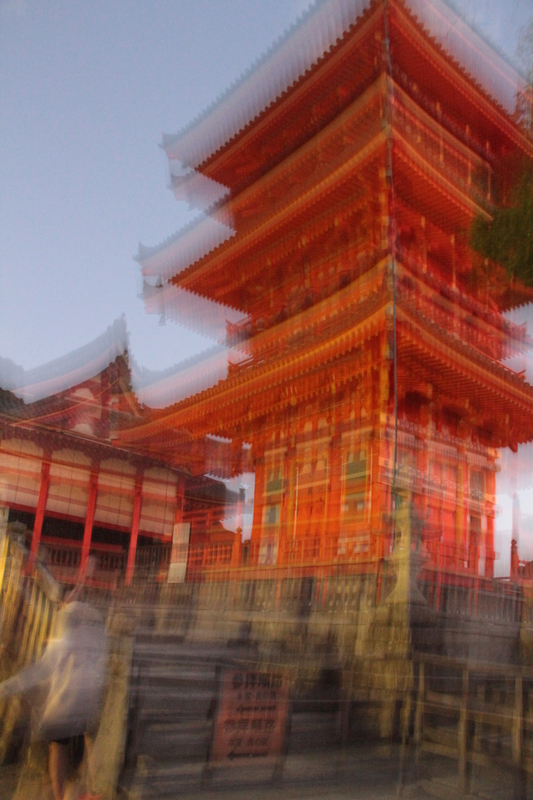 “You can see it?” He asked as he flew strides ahead of me past the aforementioned pagoda. “Yeah,” I replied snapping a quick and grainy photo. We made it finally on one of the higher platforms past the main building when Isopp finally slowed down. It’s funny, when something is so well known for it’s location and history it’s usually completely overlooked for the littler things it has to offer. I feel like during the day this view of Kyoto would’ve been neutral and mundane, but at night it really justifies the beauty of Japan was like. Among the places and the people I got to see a lot. Plenty of kimonos and old buildings mixed with school uniforms and souvenir shops.The country’s culture has evolved so drastically in the last century, yet it still tries to maintain the values it’s held for the last millennium. Posted in Travel, Weekend.Tagged interactions, Japan, relax, travel, weekend.